Beautiful and informative full-color edition from series "Plants with Scents as Heady as Incense". 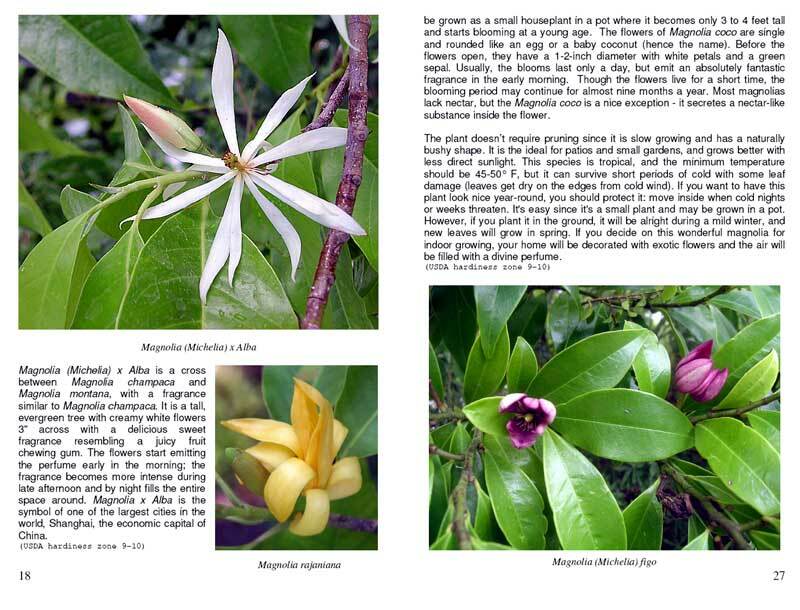 A complete info about tropical magnolias, history, species, cultivation, medicinal use and much more. 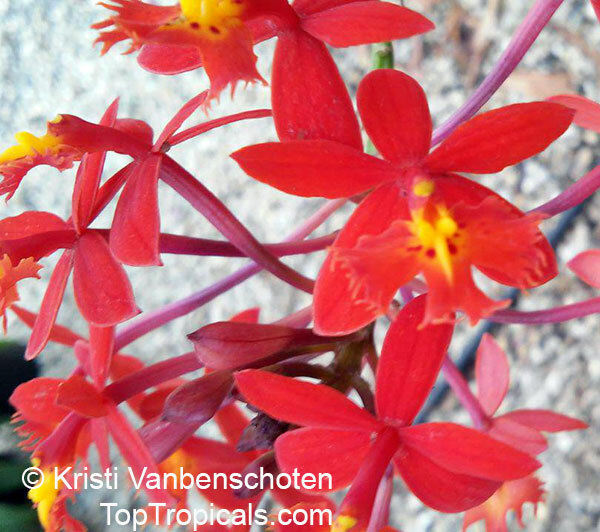 Just about anything you need to know about these plants to grow it and enjoy their beauty and fragrance. 50 color photos, 44 pages. 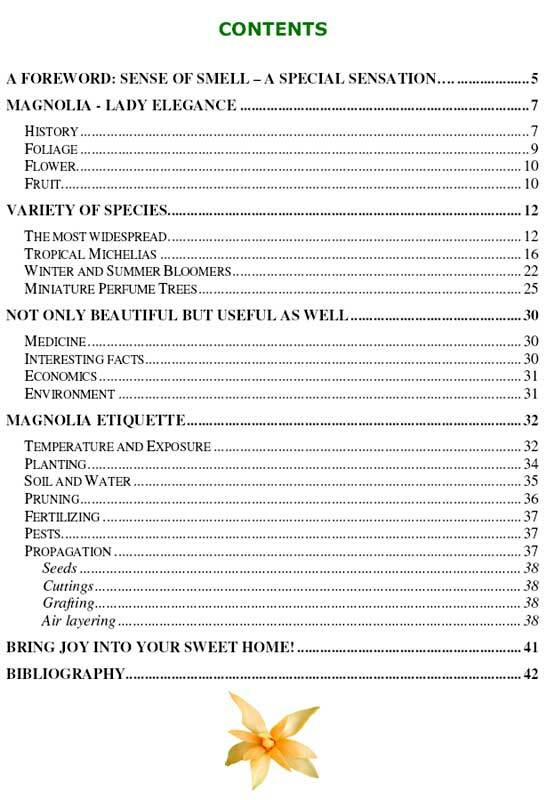 See Cover, Contents and Inside the book. Texas ebony, Ebony blackbead, Apples earring. 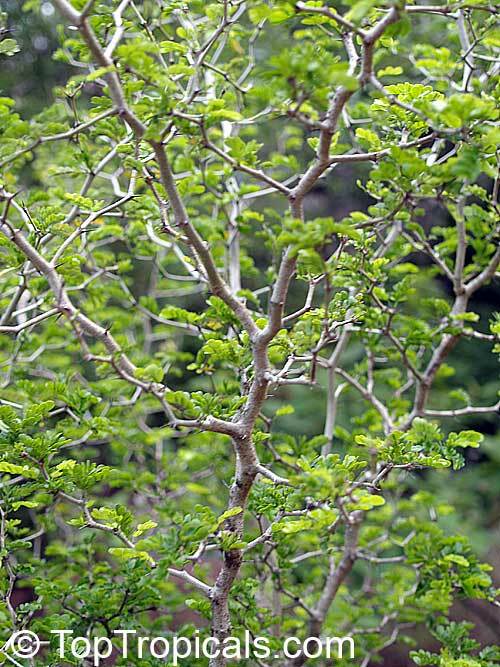 Great bonsai plant with tiny leaves and natural shape of a miniature tree. 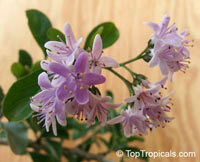 Very shrubby ornamental tree to 48' - the trunk to 4' width. Great for bonsai. Oval leaflets in 3-5 pairs oblong, much branching with small spines at base. Fragrant yellow flowers in dense slender spikes. Woody 6" fruits. Plant 1" deep in loam/sand soil mix. Keep warm and damp. Bright sun. Rudbeckia purpurea, Purple Coneflower. 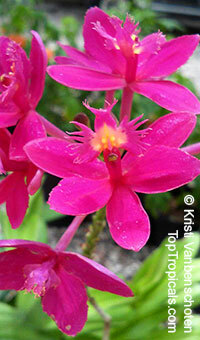 Perennial plant with large, fragrant pink flower blooms at the beginning of April and May. 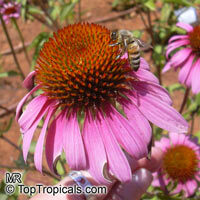 The 3 to 5 ft flower stalks make them an excellent background planting for your landscape, or in a butterfly garden. They are excellent for cut flowers, lasting a week or longer after being cut. Cutting the flowers will promote an extended blooming season. Cover seeds with 1/4" soil. Moisten the soil when it is nearly dry. Provide bright light and warmth. 20 days to germinate. Cold hardy. Sandpaper bush, Sandpaper Stamperwood. In October its pretty star flowers will be followed quickly by berries which birds will gobble up as soon as they turn orange. 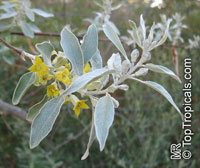 Big-leaved Stamperwood, Sandpaper bush. A medium sized shrub with blue to mauve flowers. Puzzle Bush. 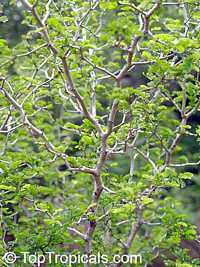 A deciduous small tree or shrub, usually multistemmed, with an rounded crown. 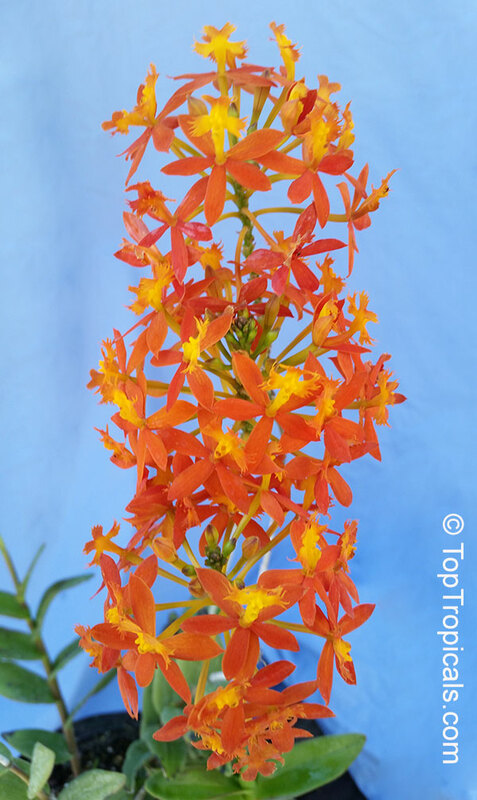 It has tangled branches which arch downwards or droop - this gives it its common name. The flowers grow in dense clusters on the branches. 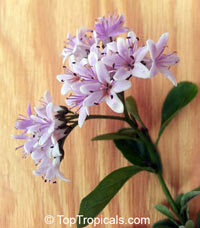 They are pale mauve, blue or white, with male and female flowers on different plants. They are sweetly scented. Fruits are edible. The Puzzle Bush is becoming very popular as a garden plant because it is hardy and drought resistant, very attractive to birds and insects and is therefore a wonderful addition to the wildlife garden. Do not sow the seeds too deeply. If they are sown properly, the seeds will take 10-20 days to germinate. 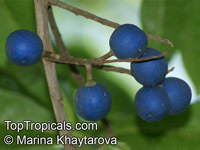 Russian Silverberry. Elaeagnus angustifolia is widely grown across southern and central Europe as an ornamental plant: for its scented flowers, edible fruit, and attractive silver foliage and black bark. 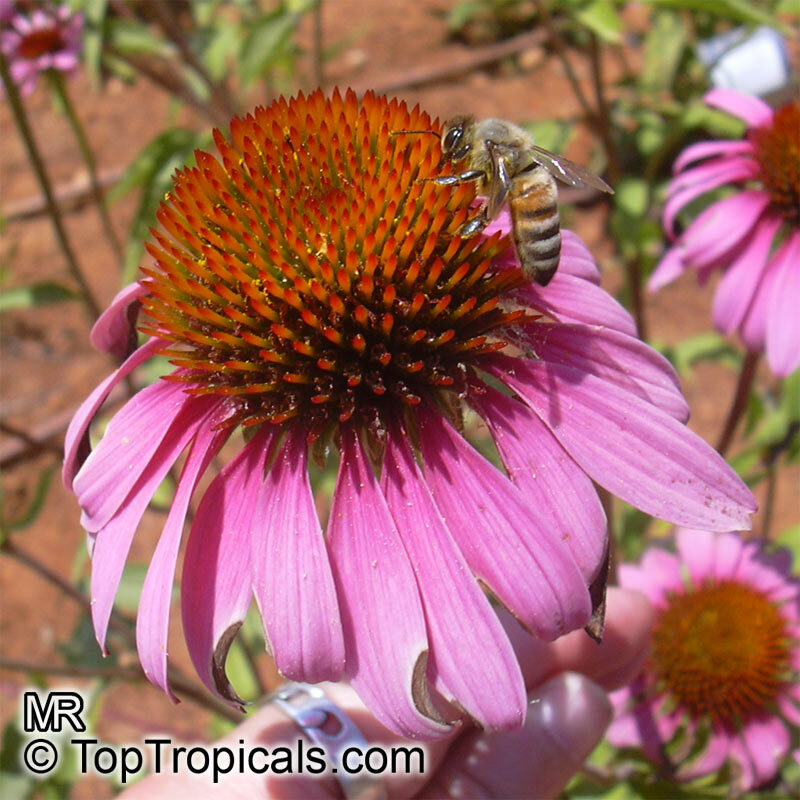 Soak seeds 24 hours, plant 1/2" deep in sandy soil and water when nearly dry. Bright light. Slow germinating. Related to Rudraksh, Rudraksa. The seed of Rudraksh tree has been given a very special place and it is credited with mystical and divine properties. It is said that the plant of Rudraksh is originated from the tear drops of Lord Shiva. Rudraksh, Rudraksa. 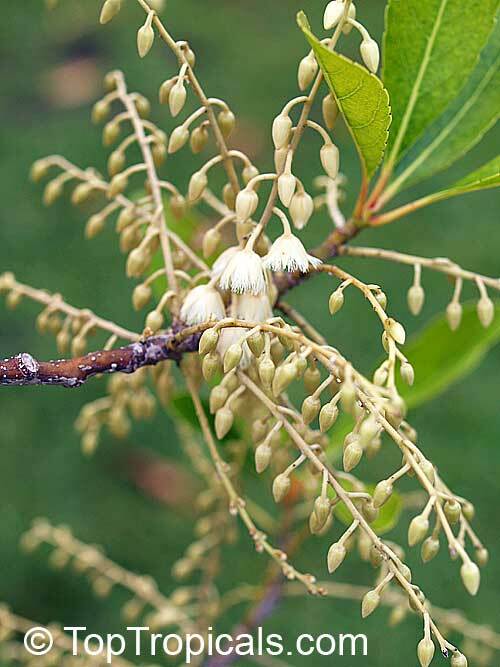 The seed of Rudraksh tree has been given a very special place and it is credited with mystical and divine properties. 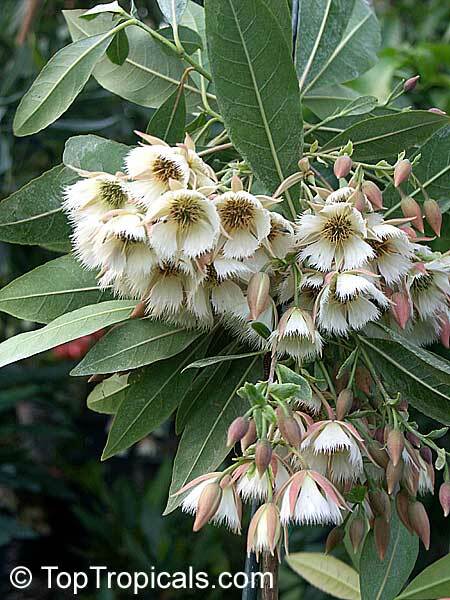 It is said that the plant of Rudraksh is originated from the tear drops of Lord Shiva. The word Rudraksh is a Sanskrit compound consisting of the name Rudra (the name of Lord Shiva) and Aksha which means eye, tear. 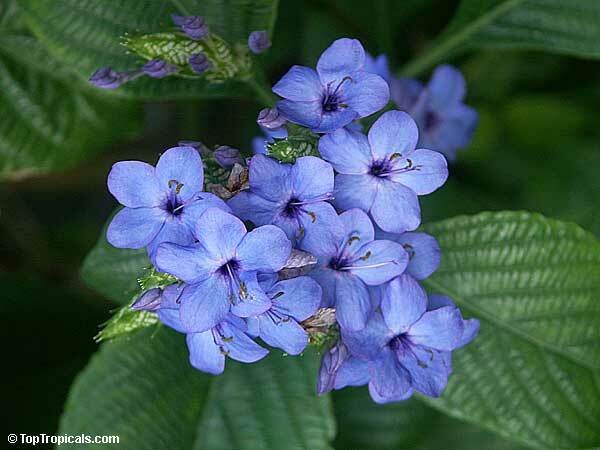 It is the most commonly grown member of the genus and is popular for its size, attractive flowers and colorful blue berries. It is adaptable to many climate zones. 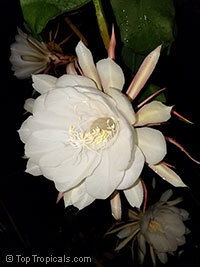 Soak seeds 48 hours, plant 2" deep in sand or mix and keep warm and damp, with bright light. Very slow germinating. Fairy Petticoats. The masses of white to pinkish flowers with unusual liquorice scent are hanging downwards, like those of lily-of-the-valley, with cup-shaped feathery petals and fringed edge, recemble small hanging skirts, hence the attractive common name of Fairy Petticoats. 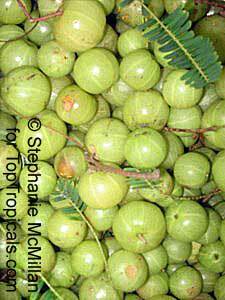 Very close related to Phyllanthus acidus, Phyllanthus emblica (Emblica officinalis) - Amla is known as amritphala in Sanskrit, which literally means the fruit of heaven or nectar fruit. 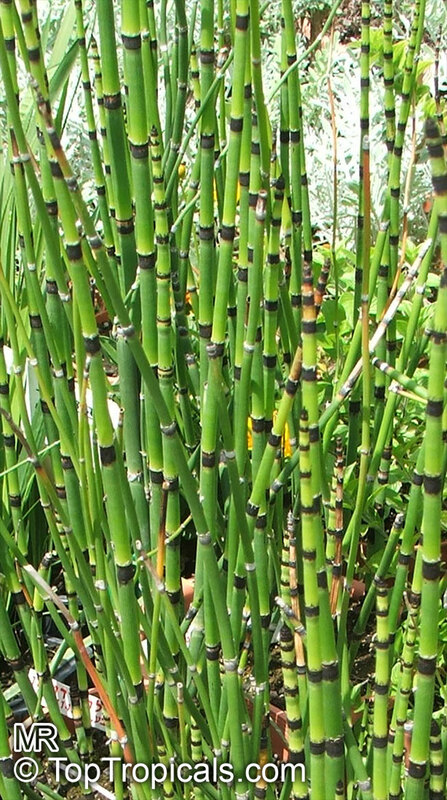 It is so called because it is rich in many desirable properties, including medicinal. Amla fruit paste is a major ingredient of Chavyanprash, a popular Ayurvedic tonic. 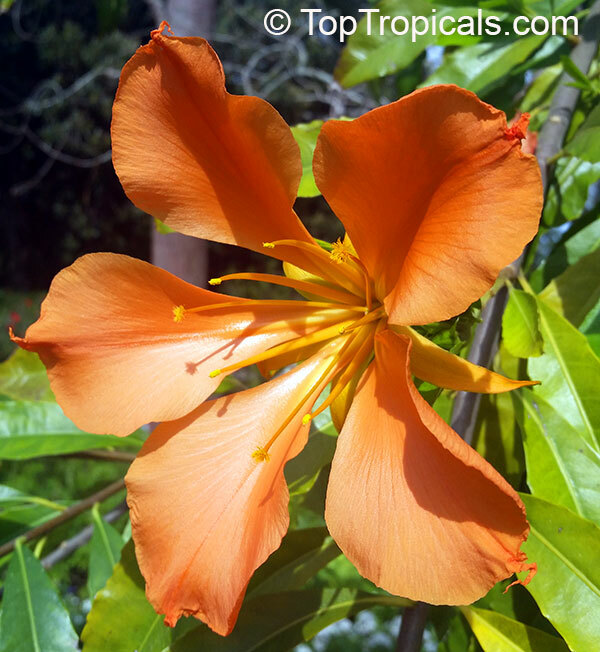 It is the richest known source of vitamin C. The fruit tastes bitter, but if you drink water after eating it, the water tastes sweet. Small to medium in size tree. The leaves are lacy, giving the tree a delicate look. Amla (Phyllanthus emblica). Fruit paste is a major ingredient of Chavyanprash, a popular Ayurvedic tonic. Amla is known as amritphala in Sanskrit, which literally means the fruit of heaven or nectar fruit. It is so called because it is rich in many desirable properties. Close related to Phyllanthus acidus. Plant immediately using well drained soil mix at 1/2" deep and keep warm, only lightly moist, in bright light. Mountain Mahogany, Half-peeled Banana. 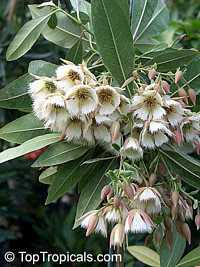 Mountain Mahogany is a large Southern African tree. 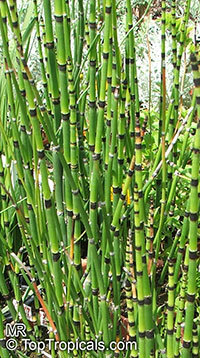 The fruit of this species is remarkable and when green has the form of a cigar- or club-shaped capsule. 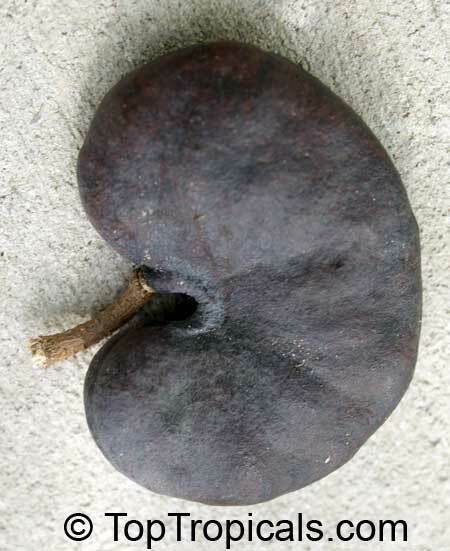 When mature the five woody, closely lenticellate, pale brown valves curve back from the thickened tip, leaving a central column intact with impressions of the seeds - in overall appearance that of a half-peeled banana. 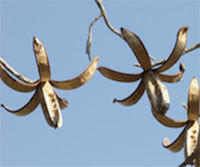 Seeds are large and winged, and carried some distance from the tree by wind. Monkey Ear, Ear Pod Tree, Elephant Ear Tree. Large feathery shade tree. The legume pod is curled up and looks like an ear. 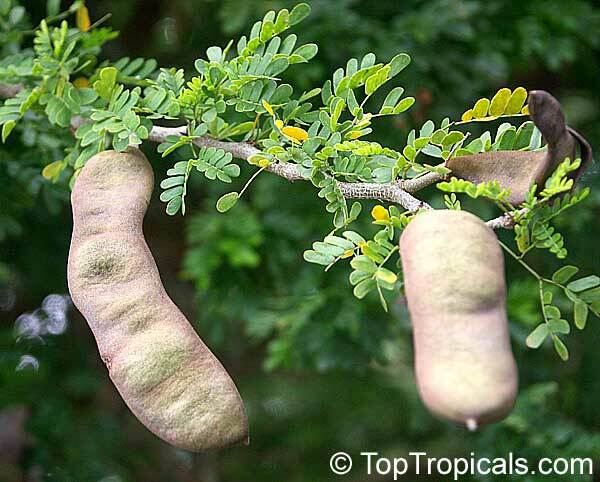 The pods of this tree are used extensively as decoration and for crafts. Black Magic, Black Varnish. 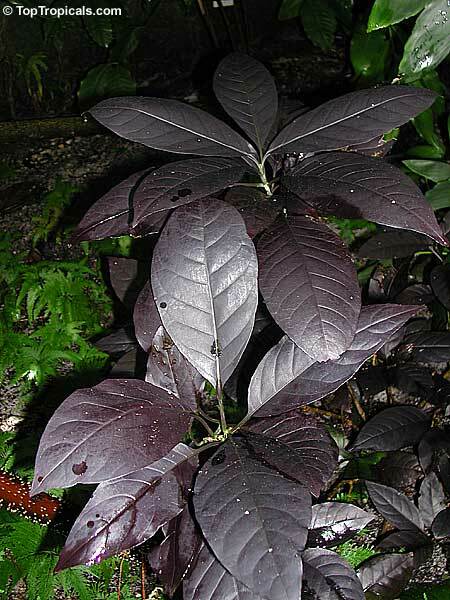 This is a striking plant with unusual almost black leaves: it has deep, chocolate-burgundy, glossy foliage with a short spike of white flowers late in summer. A fine candidate for container combinations or to create foliage contrast in the mixed border. 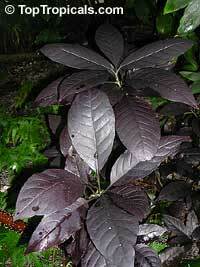 If grown in filtered light, leaves get larger and darker. 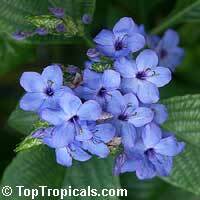 Blue sage, blue eranthemum - bright gentian blue - an unusual color in the tropics, winter bloomer, shade lover. 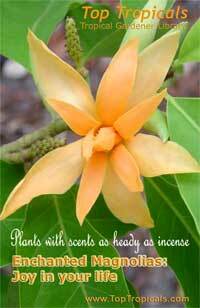 Flor de Fuego, Butterfly Tree. A very rare tree in cultivation, this is the newest, most exciting tree to be introduced in the last decade. 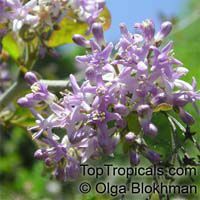 It said to be one of the most beautiful flowering trees in Central America. Large flowers 6-8" across smell like apricots.